Make sure to read to the bottom for winner of the Popchips contest! My ethnic past now well documented, as well as my love for all foods ethnic. So when I moved to New England, and learned that we share a building with an Armenian family, well instantly my thoughts turned to tabouli, hummus and grape leaves! And I was not disappointed. The one day, Lara and I were at the farmers’ market, and we came across Seta. Seta was selling something called Metch. What? A middle eastern food I have never heard of? How can this be? I had to have it. I was instantly in love. Fast forward a couple of months, I am speaking with my neighbor and I say “what is that heavenly smell?” (I am always inviting myself to eat their food by the way…) She says “Oh, that’s eetch.” “Eetch?” I say, and peek around the corner. Low and behold, there was a beautiful mound of the delicious Metch which Seta first introduced me to. Angels sang and the sun shined down, and I enjoyed another bowl of Metch (which I now know is also called Eetch). Well what is this amazing salad you ask? 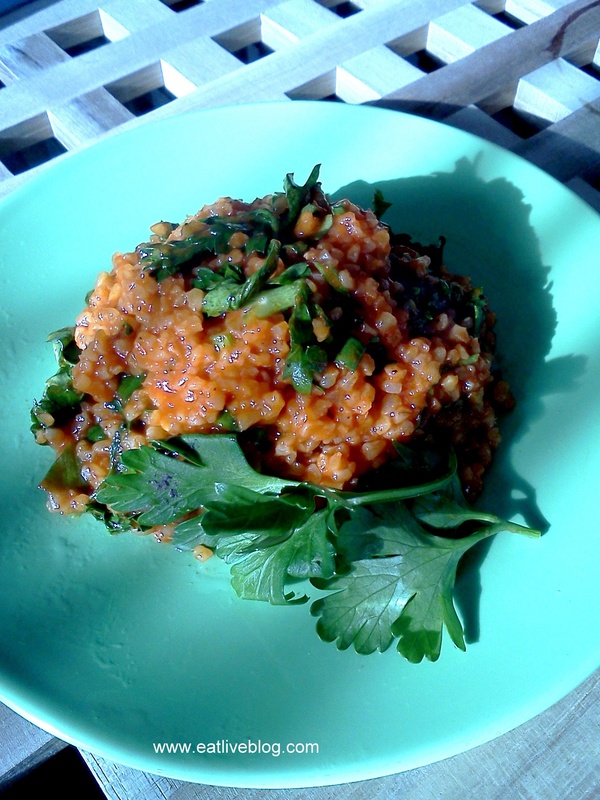 Well, it is bulgar wheat with lemon, tomato, spices, parsley, and spring onions. It can be served hot or cold and can be either refreshing or comforting…now that is a food! 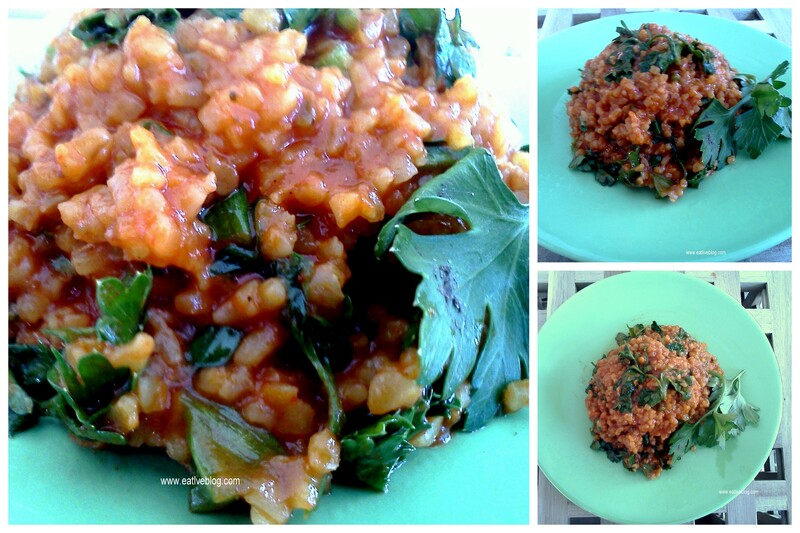 Wait, what is bulgar you ask? Well only my very favorite grain ever! It is essentially cracked, dried wheat. You can find it in ethnic grocery stores, or in the grains bins and Whole Foods. 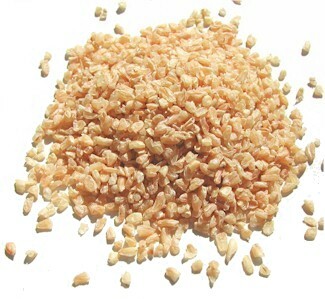 Bulgar is super versatile, and can be replaced for any grain in most recipes. Don’t forget to keep reading the Popchips winner! Do you “Like” Eat.Live.Blog on Facebook yet? If you are in the Boston area, I am running a contest for a great event! Serve as a side dish or salad, hot or cold! Wow! You all REALLY like your Popchips! And I don’t blaim you! With well over 60 entries, I used Random.org to select the winner. Congratulations to Jordi and Robyn L! Please email renh77 at gmail dot com with your mailing address and I will send you your Popchips! This entry was posted in Recipes and tagged armenian, blog, boston, bulgar, bulgar wheat, eetch, metch, middle eastern, Popchips, recipe, salad, side dish by reneeh. Bookmark the permalink. Yum! I have got to try this. Thanks!! So funny! It was the other way around for me. My boyfriend introduced me to Eetch, which he was excited to make for me as it was an Armenian dish that was easy and vegetarian. Last fall I met Seta and saw her metch, and I said, well that looks just like eetch, and she explained that they’re the same thing and it is just called different things. I found Seta at the farmers market over the summer, tried metch, and bought a little tub of it right way. 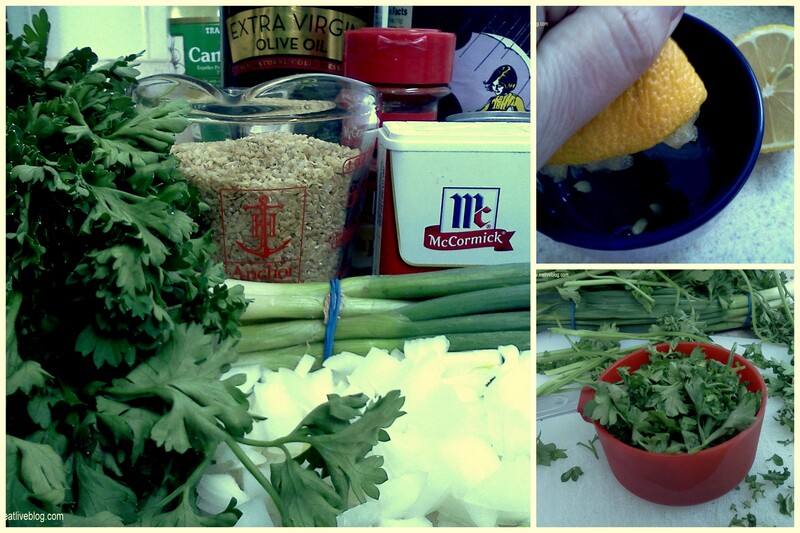 I may have to make it myself at some point too… thanks for the recipe! Love the stuff. All us middle-easterners have similar dishes w/slightly different names! And if you don’t feel like making it, Sevan has great Eetch! Hi! Just googled “metch recipe” and your blog came up first. Another fan of Seta’s food, from the Davis Square farmer’s market. Yum! Same here…I just bought some Seta’s Metch at the Copley market a few days ago. I didn’t even try it. I just bought it because it looked interesting and I love to try new foods. I wish I had bought more! So, until I get back to Boston, I will be making some from this recipe. Thanks! This is the BEST RECIPE for Metch i have ever tasted. I make it at least 3 times a year and always double the quantity! Everybody LOVES IT!!! These recipes look great! It’s awesome to see so many delicious recipes in one place.